After numerous declarations following Tony Fernandes’s takeover at Loftus Road back in 2011, QPR finally presented their plan for a new home. The club’s Malaysian owner and chairman spoke yesterday about the plans. Tony Fernandes: “Loftus Road is – and always will be – a special place for the club and our supporters, but we need more than an 18,000 capacity. “With no option of expanding here, we have to look elsewhere and we welcome the Mayor’s and Hammersmith & Fulham Council’s commitment to regenerate the area, which includes an option to develop a new stadium at Old Oak as a key catalyst to bring forward redevelopment, cementing our future in this part of West London. The new stadium, nicknamed New Queens Park, is to be placed just 2.2km north of the existing one and hold far larger number of fans than Loftus Road, estimated roughly at 40,000. 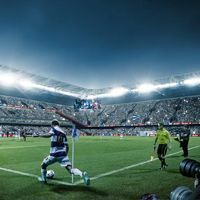 Though its size will dwarf the current ground, it’s expected to recreate some of the intimacy that Loftus Road provides. Apart from the Hammersmith and Fulham Council the club teamed up with Stadium Capital Development, the very same company that relocated Arsenal FC to Ashburton Grove a few years back in a similar scheme. Just like in northern London, in this case the new stadium is expected to be the very beginning of a far greater regeneration of the Old Oak common. Should the venue work as the expected catalyst, it should eventually bring about the creation of a residential and commercial area covering several hundreds of acres – larger than Canary Wharf – ultimately generating 50,000 jobs and 24,000 homes. As the project’s scale is exceptional, no detailed timeline has been presented at this point. All sides have to work closely to provide the best possible solutions especially in terms of public transport and access to the site so that the huge influx of matchday crowds, workers and inhabitants is possible in the future.